Ruth (Rosamund Pike) works as a clerk and would mostly have a boring life if her sister (Laura Carmichael) didn’t drag her out every once in a while. On one of those outings, Ruth meets Seretse (David Oyelowo). He is charming, good-looking and taken by Ruth. But as Ruth discovers he is not just a student, but also the prince and future ruler of Bechuanaland. Despite the difficulties by their difference in status, the two want to get married, not anticipating that the real (diplomatic) scandal for both Bechuanaland and Great Britain is the fact that their relationship is an interracial one. 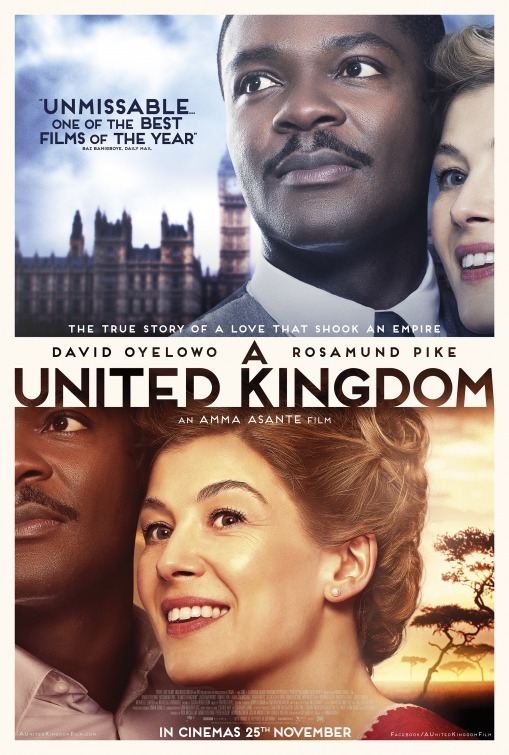 A United Kingdom covers a bit of history that is virtually unknown here (Austria or most likely Europe or the global North in general) and Asanta packs this fascinating story into an easily understood and emotionally engaging film with a great cast.